The Moon is new in Taurus and the season is shifting from the warmth and languid energetic of the Summer to the active, Firelight dynamism of the Autumn. In the spirit of this Taurus Moon I have contacted a few of my perfume blogging friends to cross pollinate ideas on Bees, Honey and Perfume. At the bottom of this post please follow the links to five other worker bees who create immortal honey with their golden words. 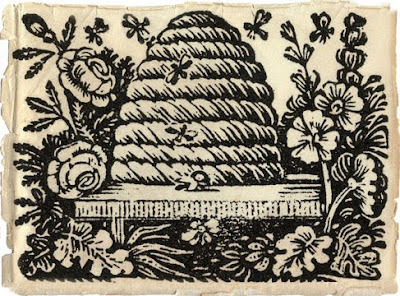 My obsession with the bees began in art school through beautiful engravings found in books published by Dover and Thames & Hudson. There was a magic to the iconic image that sang sweet songs to my art spirit. In May, possibly 2004, Greg and I were at our yearly attendance of the Bug Fair at the Natural History Museum in downtown Los Angeles. While strolling the aisles and drooling over glorious bugs resembling little cars and African masks Greg stopped at a booth and made a purchase. It was a gift to me, in the form of a book titled Love in the Garden by Jean-Pierre Otte. The first of several short stories is an enchanting tale of a little velvet corseted bumblebee in The Astonishing Deception of the Bee Orchid. After reading this eight page poetical fancy I was quite keen on using the Bee as part of my branding. 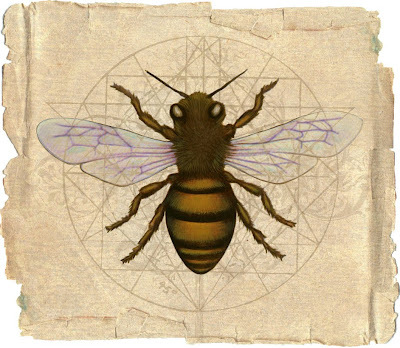 The symbolism of the the divine honeybee originates from their ability to work as an individual and within a team to create an intoxicating elixir from the sweet aroma of flowers. An indie, niche botanical perfumer is very much like a honeybee, dependent on flowering plants to create their luxurious potions. In sacred texts throughout the East the little flying insect symbolizes the quest for the divine. Often we see the bee associated with royalty. 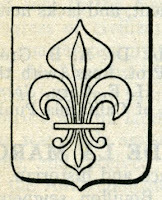 In fact the Fleur de Lis stems from the image of a honey bee. In the palette of the natural, botanical perfume artist we find the absolutes of Beeswax and Honey coming from France. Predominantly it is the golden yellow, solid buttery beeswax absolute, termed Absolue Cire d’Abeille in French, that is utilized for the creation of natural perfume. The beautiful substance has notes of sweet hay combined with the warm waxy body note of beeswax. 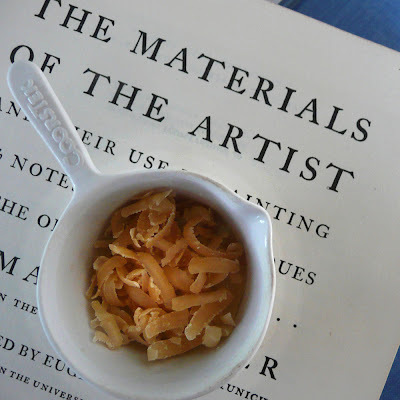 Like honey, the odor of beeswax absolute will depend on the terrain from whence it is derived. The natural perfumer also utilizes the pure beeswax for the creation of solid perfume, creams and body butters. Since visiting friends with bees in Ojai and Carpentaria I have been yearning to care and tend a hive of bees. It was an article in the LA Times Magazine that led me to a Los Angeleno named Kirk, who facilitates others in caring for bees in a holistic manner. Curious and determined to manifest my dream I attended a local meeting of his group the Backward Beekeepers. This group has a blog, yahoo group and gets together once a month to share their stories and techniques on tending bees in a chemical free manner. Upstairs in the Studio City home of one of the members Kirk started the meeting by stating that the goal of the Backward Beekeepers was very simply "To change the world." My kind of guy! So now I have two new heroes, both deeply connected with organic agriculture, Kirk and Farmer John (John Peterson). Kirk explained that the bee's problem, like most of nature, is man. There is quite a bit of misinformation being circulated in the media about the bees. One would think that since bees are critical to our diet and environment, conscious mass action would occur. Like stopping the use of all herbicides, fungicides and pesticides for example. Since this is currently not the case I will do what I can in my little microcosm to affect the macrocosm. I invite you to do the same. Our global hive needs some tending so that we may all evolve to, as Tom Robbins in Jitterbug Perfume says, an illuminated state of floral consciousness. The two are portentously linked. Bee Illustration ©Roxana Villa, was created first as a painting with the final image collaged together in the computer using Photoshop. It is with remarkable skill that societies such as bees organise everything and continue to do so even in such a hostile environment as the one we're creating for them. I hope that your wish for them materialises and that bees (and men) are given room to breathe freely...as they should. Thanks for adding the buckle to your Treasury on etsy! Make.It.Mine Finds are HUGE fans of Tom Robbins, in particular Jitterbug Perfume! Lovely post Roxana, thank you so much for organizing this project. Here's to the amazing Bee! This is so beautifully written! Thank you Roxana for getting us all together to play. I had a blast! PerfumeShrine, what a beautiful wish, which I am sure we have all helped manifest just a bit with our little blog-o-rama. Holly, thanks for stopping in here and taking a peak at the treasury. How synchronistic that Make.It.Mine Finds are HUGE fans of Tom Robbins. Perfect! Lara, thank you so much. Cheers to the beauty you create. ScentHive, a pleasure to have you bee part of our little adventure. Beth, what a lovely comment from an expert Bard-ess. Roxie! Moved by your poetic swim through life. Am reading The Secret History of the World: As Laid Down By the Secret Societies by Mark Booth and in it he says something about bees that I want to share with you. If you ever get the book, P. 155 has a joyous image of lusciously-breasted, bee-hive headed Sumerian goddesses dancing. 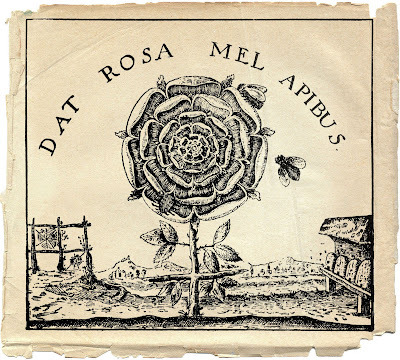 Here's the quote: "The bee is one of the most important symbols in the secret tradition. Bees understand how to build their hives with a sort of pre-conscious genius. Beehives incorporate exceptionally difficult and precise data in their construction. For example, all hives have built into them the angle of the earth's rotation. Sumerian cylinder seals of this time show figures with human bodies but bees' nests for heads. This is because in this period an individual's consciousness was experienced as made up of a collaboration of many different centers of consciousness. These centers could be shared or even moved from one mind to another like a swarm of bees from one hive to another". Here's to Bee-Mindedness!! Love to you from Cambridge! Finally the Bee-story! I was curious about it...lovely story! Your post on bees and beekeeping was wonderful. Have you read Steiners book on bees? He was so far ahead of his time. Along these lines is biodynamic farming/gardening that is not only organic but in tune with the stars and planets. Fascinating! We visited Hawthorne Valley Farm (biodynamic) in the Hudson valley last month while we were visiting my parents. I wonder if there are other biodynamic farms around. I know of the one that sells grape alcohol. It would be interesting to visit. Grapes are not pollinated by bees, but by the wind . . .